Premium collectible Candy Land game. 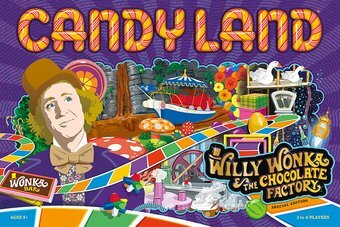 Bring two of your favorite childhood memories together with CANDY LAND®: Willy Wonka & The Chocolate Factory™! All of your favorite locations from the classic film come to life on the custom illustrated Candy Land® game board. Press your luck and make your way through Willy Wonka’s Chocolate Factory. Travel passed Everlasting Gobstoppers and Wonka Bars to reach the Wonkavator and claim your victory! Ages 5+ | 2-4 Players.